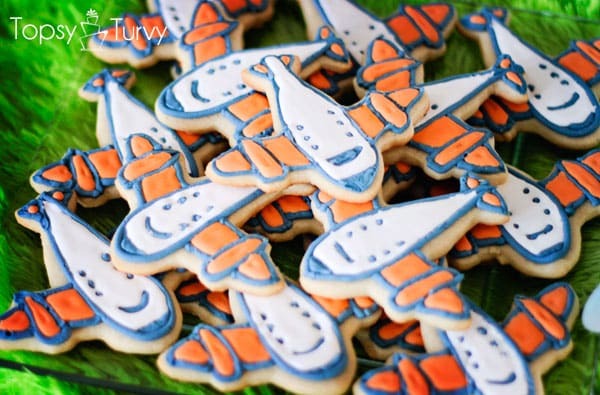 This week I’m going to be sharing my airplane baby shower all week, today is the airplane cookies, Wednesday the cake, Thursday the invitations and Friday the rest of the party, including the labels! I hope you all enjoy it! It was such a fun party to throw for my sweet cousin. 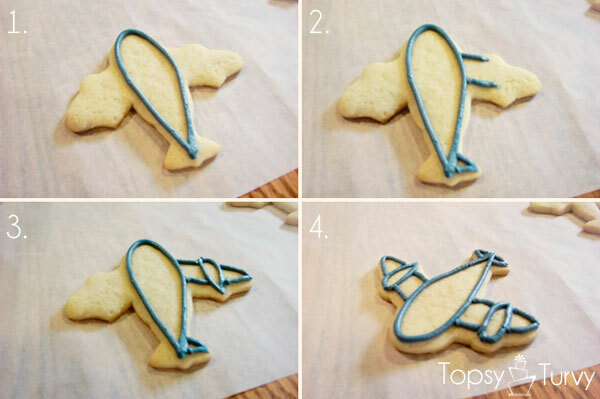 Take your favorite sugar cookies, but for this method if you want the frosting to dry hard so you can stack them you need to use royal icing, so it’s mostly sugar, and looks AMAZING, but isn’t he most tasty frosting. You CAN use my classic Sugar cookie frosting, making it thick for the outline and thin for filling in, but while the frosting will crust over you won’t be able to stack them. But it does taste better in my opinion…. First we’re going to outline the shape you want. I started with the MAIN space, then did one side of the details then the other. You want to make sure your outline connects everywhere without spaces or holes. 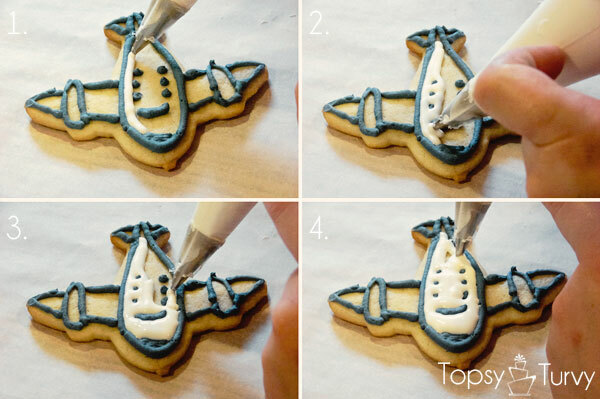 Then any detail work in the center, I was going off an image of a plane I tweaked and colored for our party… do this to ALL the cookies and let the outlines dry completely. Take the royal icing and THIN it out, after you’ve thinned it, plop a bit of the frosting back into the main bowl and count to 10, if the plop and/or lines created when you dropped it in have disappeared and you have a nice smooth surface again it’s thinned enough, if not add a bit more water, mix and try again. Go slowly, like half a tsp at a time, you can always add more water, but if you go too far you can’t take it back out! Now we’re going to fill in the design, doing one space at a time,works smoothly and quickly, starting with a side and moving your way over. You want it to bubble up over the edge of your outline JUST a bit (but not overflow) creating a pillowy effect..
Let it dry completely between each color! Fill in every space and your done! Once they are completely dry you can stack them. 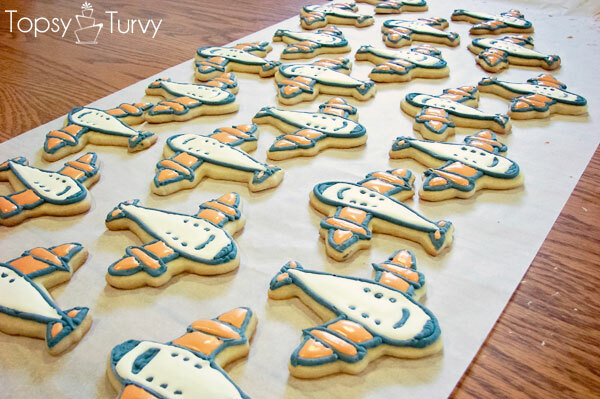 And here you can see the plane I tweaked for the labels and used as my cookie inspiration! More on the party all week! I can’t wait to share it with you guys. fill in with the white and orange and let crust over and dry! thanks, and thanks for taking pictures AGAIN for me! Oh I love these so much!! 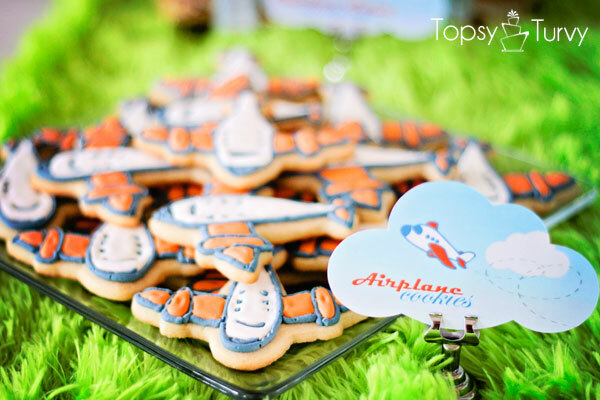 My husband loves airplanes & these would be so great to have at my sons first birthday. Thank you so much for sharing this wonderful tutorial! I would love it if you would come share your wonderful talent over at Sunday Round Up http://www.kaylascreationsblog.com/2012/04/sunday-round-up-5.html Hope you have a wonderful week! This version of frosting is really fun and pretty, but not quite as tasty. if you don’t have to stack them I’d use butter and milk in the frosting for taste!